The 80’s are Back ! Enjoy the fantastic atmosphere and the best dance hits and videos of the 80’s. The event covers all the decade’s music styles such as Disco, Pop, Italo-Dance, Electro, New Romantic, New Wave, Reggae and Rock…Just 80’s ! 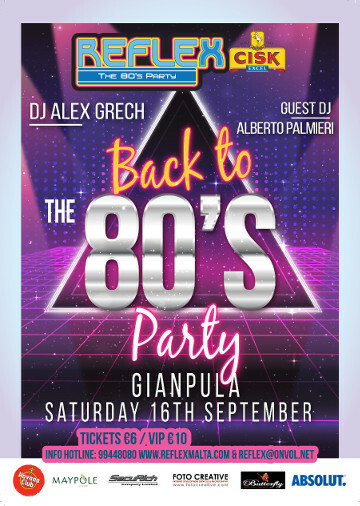 Reflex Promotions presents The Reflex Party at Gianpula (Open Air) on Saturday 16 September with DJ Alex Grech & Guest DJ Alberto Palmieri (Rome). The Reflex 80’s Party is in its 13th consecutive year and is considered as one of the biggest in Europe.